There are conflicting reports coming out involving an injured migrant worker employed in Chatham-Kent. 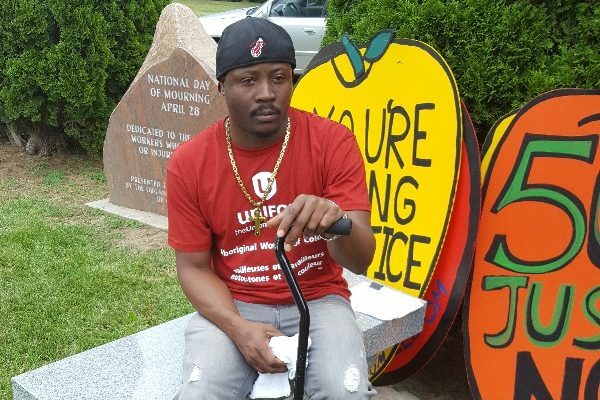 Kevin Campbell, 33, is heading back to his home country of Jamaica Thursday with a tear in one of his back muscles and a strained lumbar region. This after he allegedly fell from a scissor lift in June while working at Greenhill Produce near Thamesville. Campbell has been working in Chatham-Kent as part of the Seasonal Agricultural Workers Program, established by the federal government. He’s been receiving medical treatment since the accident, but he says he’s still not 100%. Campbell claims he has tried to continue working. “I’ve tried to go back more than once, but my body’s in pain,” says Campbell. Campbell says he was told of his flight back home the day before his departure. He also fears his injury will affect future work opportunities. “I’ve been doing this for 15 years, and this is what I see every time. It’s the same story where migrant workers will see some healthcare in Canada, but instead of making sure they’re healed, they’re sent back home,” says Ramsaroop. Greenhill Produce’s side of the story, however, is quite different. In an email to BlackburnNews.com, Greenhill’s Justin Geertsema says the company has been working closely with the Workplace Safety and Insurance Board (WSIB) and Campbell’s contractual representatives, the Jamaican Liaison Service, ever since the accident. Greenhill says Campbell was slated to return to Jamaica in the second week of June. After the injury, Greenhill Produce agreed with all parties to keep Campbell’s contract through to September 8. This was done, according to Geertsema, to allow Campbell to “participate in his recovery process here in Canada until it was deemed suitable for him to return home under direction of the WSIB.” Greenhill adds Campbell had “full knowledge and agreement” in the plan. Geertsema adds the company also set up a graduated Return to Work plan, deemed suitable by the WSIB, so Campbell could slowly ease back into working at Greenhill Produce. He says Campbell’s medical specialist also approved of the plan. The statement also says the WSIB approved Campbell to return to work, without restrictions, in the middle of August. As for his flight home, Greenhill says it’s their legal obligation to set up transportation back home for their migrant workers. Officials say it’s Campbell’s decision whether or not to accept the transportation he’s been offered. “Greenhill has ensured that we have done our due diligence and more to aid Kevin Campbell in his recovery,” Geertsema says.